I seem to have no photograph of me in my 1973 role as Mister Twister the Magic Clown (30 shows for the Toronto charity group, Inner City Angels). 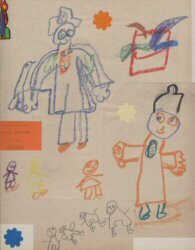 However, here are drawings of the character by young artists who witnessed his wackiness. 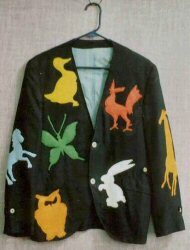 Also shown is the funny man's coat; his costume included a twisted top hat and flower, crooked eyeglasses, and a zigzag tie. Children found Mister Twister funny just to look at. He also created funny effects by twisting rope, paper, and balloons into magical forms, although his magic tricks per se never worked, backfiring at his expense. 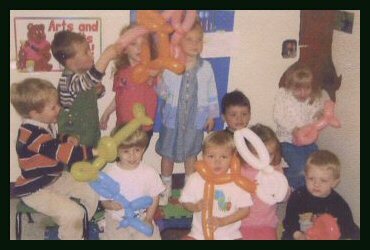 Here too is a photo showing the fruits of a similar appearance I made in 2004 for a grandson's kindergarten class. See also Magic Pitchman and Stage Magician.